Seems like I can't open a newspaper—or, more accurately, click a bookmark on my browser—these days without coming across an article on the ongoing raw milk debate. In Massachusetts, it's being framed as a libertarian issue. As a farmer from Eastleigh Farms, in Framingham, 25 miles from Boston, said as he led the cow, Suzanne, back into his truck, "DPH should stay the hell out of this. It's none of their affair. Corporate milk is doing this." (The farm's website has a summary of coverage of the rally.) 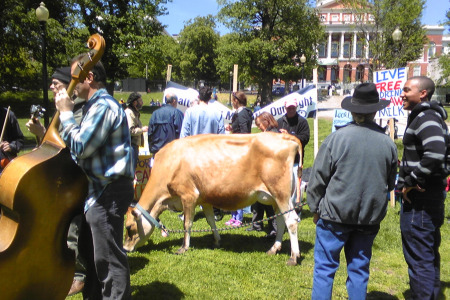 The Northeast Organic Farming Association Raw Milk Network is an active supporter of raw milk, and helped organize the rally; it lists the state's raw-milk dairies and provides updates on campaigners' efforts to keep buyer's clubs alive, urging state residents to "Please continue to buy milk from Massachusetts raw milk dairies, spread the word about this wonderful food, and keep speaking out about the importance of preserving food freedom."